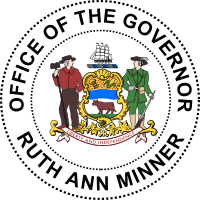 Ruth Ann Minner (born January 17, 1935) is an American politician and businesswoman from Milford, in Kent County, Delaware. She is a member of the Democratic Party who served in the Delaware General Assembly, as the 23rd Lieutenant Governor of Delaware, and the 72nd (and first female) Governor of Delaware from 2001 to 2009. Minner was born Ruth Ann Coverdale at Slaughter Neck in Cedar Creek Hundred, Sussex County, Delaware, near Milford. While growing up, she left high school at age 16 to help support her family. Subsequently, she married Frank Ingram with whom she had three children: Frank Jr., Wayne and Gary. When she was 32 her husband died suddenly of a heart attack, leaving her a single mother with three children. She earned her GED in 1968 and later attended Delaware Technical and Community College, while working two jobs to support the family. In 1969 she married Roger Minner and together they operated a family towing business, the Roger Minner Wrecker Service. Roger Minner died of cancer in 1991. Ruth Ann Minner began her political career as a clerk in the Delaware House of Representatives and as a receptionist in the office of Governor Sherman W. Tribbitt. In 1974 she was elected to the State House as a member of the "Watergate Class," a group of newly elected legislators from both parties, who came into office on a "good government" mission and a strong sense of their ability to make significant improvements. Minner rose to become Delaware's most powerful female politician, but she did it in a very conventional way, representing a rural, small town constituency, and building relationships and expertise by working in the legislative process over many years. She served four terms in the State House, from the 1975/1976 session through the 1981/82 session. At various times she served as House Majority Whip and chair of the powerful Bond Bill Committee. She also chaired the Rules Committee. In that role she led several successful reforming efforts, including a change that removed the rule allowing Representatives to table roll call votes. This rule was used to help schedule votes when only the right combinations of Representatives were on the floor. In 1982 Minner was elected to the Delaware Senate and served there from the 1983/1984 session through the 1991/1992 session. While in the State Senate Minner was noted for her sponsorship of the Delaware Land and Water Conservation Act, a key piece of legislation that protected 30,000 acres (120 km²) of land and created the Delaware Open Space Council. To fund the activities of this Council the General Assembly created the "Twenty-First Century Fund" from the proceeds of a multimillion-dollar corporate securities lawsuit. Elected Lieutenant Governor in 1992, she served two terms from January 19, 1993 to January 3, 2001. While in that position she chaired the Minner Commission on Government Reorganization and Effectiveness. Minner was elected Governor of Delaware in 2000. She had secured the Democratic nomination after her long years in the General Assembly, as Lieutenant Governor and her demonstrated ability to run a campaign by her large statewide victory margins in 1992 and 1996. Her opponent in 2000 was Republican John M. Burris, who had barely survived a bitter September primary contest with retired judge William Swain Lee. Minner won easily. As the incumbent Lieutenant Governor, Minner took office upon the resignation of Governor Thomas R. Carper on January 3, 2001. Upon completing the unexpired term, Minner began her first full term on January 16, 2001. She served as the first female President of the Council of State Governments in 2005. Regarding education, she said, "While it might be popular, it is not demanding to set standards that all students can meet right away.... Once high standards have been set, the key is to give our students, educators and parents the tools to continuously improve." She supported "giving local schools control of [most] new education dollars... expanding after-school and weekend class programs... and supports reading and math specialists." She opposed vouchers. "In 2005, she signed legislation creating the Student Excellence Equals Degree (SEED) Scholarship program, which enables students who keep their grades up and stay out of trouble to go to college for free in the state of Delaware. She also expanded her education specialist program, which has placed reading specialists in every elementary school, to also include a plan to place math specialists in every Delaware middle school." On other issues she was "a firm supporter of a measure that would simply add sexual orientation to the list of characteristics in the Delaware code... that are not allowed to be used as basis for discrimination." She opposed "new gun control legislation," but supported "legislation requiring mandatory trigger locks and gun safety courses in schools." And she said "I do not support additional sites or kinds of gambling... the state should not become any more reliant on this form of revenue." Elections are held the Tuesday after the first Monday in November. Members of the Delaware General Assembly take office the second Tuesday of January. State Senators have a four-year term and State Representatives have a two-year term. The Governor and Lieutenant Governor take office the third Tuesday of January and each has a four-year term. Wikimedia Commons has media related to Ruth Ann Minner. ^ Hoffecker, Carol E. (2004). Democracy in Delaware. Cedar Tree Books, Wilmington, Delaware. ISBN 1-892142-23-6. ^ "Voters Guide 2004". Sunday News Journal. October 24, 2004. p. 5. ^ "State of Delaware - Governor Jack Markell - Biography". state.de.us. Retrieved 13 May 2015. Boyer, William W. (2000). Governing Delaware. Newark, Delaware: University of Delaware Press. ISBN 1-892142-23-6. Martin, Roger A. (1995). Memoirs of the Senate. Newark, Delaware: Roger A. Martin. "Voters Guide 2004". Sunday News Journal. October 24, 2004. p. 5.